If you were still live, Refentše, child of Tiragalong, you would be glad that Bafana Bafana lost to France in the 1998 Soccer World Cup fiasco. Of course you supported the squad. But at least now, you would experience no hardships walking to your flat through the streets of Hillbrow—that locality of just over one square kilometre, according to official records; and according to its inhabitants, at least twice as big and teeming with countless people. This is not, as some mistakenly assume, a second person perspective, but rather a communal first person plural voice, speaking from a universal omniscient viewpoint to a character who is dead. It is a narrative form that freely moves from the physical to the metaphysical and back again. By drawing on traditional storytelling techniques, language, and expressions to tell a story that is rooted in one of the most crowded, disadvantaged, and violent inner-city neighbourhoods of post-Apartheid Johannesburg, Mpe is able to explore the intersection of complex issues—linguistic and literary marginalization, xenophobia, suicide, AIDS, and rural superstition—with a dazzling immediacy and intensity. Mpe (1970-2004) was born in Limpopopo Province (formerly Pietersburg) in northeastern South Africa and, like his main character, Refentše, he moved to Johannesburg at the age of nineteen to attend the University of Witwatersrand, which had recently opened its doors to black students. Unable to afford accommodation on campus, he lived in Hillbrow. He would go on to complete an MA in publishing at Oxford Brookes in the UK—an experience that he would, in his novel, grant Refilwe, the female character whose life crosses and parallels that of Refentše. Thus, Mpe’s urban and rural experiences, informed by his modern liberal arts education, contributed to the development of a distinctive new literary voice, one which would be cruelly silenced all too early when he died suddenly at the age of thirty-four. The voice that carries the narrative directly addresses the primary character throughout the course of this short novel, and is at once challenging and understanding. The voice recounts Refentše’s actions and emotions for him, reminding or reinforcing a memory of his experiences because he and most of the primary characters have met untimely or unfortunate fates by end of the book (or, if you would rather, before the account even begins). This is a narrative to the dead from the dead. This unusual approach not only allows for a surprisingly effective engagement with a tragic tale of unfortunate coincidences, misunderstandings, and consequences, but it also creates a unique dialectical context for the exploration of the deep and critical issues that lie at the core of the story. In simple terms, although it does not unfold in a straightforward manner, Welcome to Our Hillbrow, follows two main characters: Refentše, who comes to the city to study, and settles in Hillbrow, becoming a sensitive observer of the community; and Refilwe, his childhood friend and former girlfriend, who arrives in the city shortly before his death. He falls in love with Lerato, the “Bone of his Heart,” who is also an academic. But his mother and fellow villagers are not happy to see him with a city woman—urban/rural prejudices are acute. When a couple of unfortunate moments of infidelity “shatter” his enthusiasm for life and lead to his suicide, Refilwe exasperates the situation by implying that Lerato is the daughter of a Nigerian man, a curse that plays into a deep-seated xenophobia toward African migrants that still exists in some black South African communities today. Tribal justice, more suicide, and madness follow in the wake of Refentše’s death. Yet the narrator continues to address him in Heaven, where he is able to observe the action that ensues but is, of course, powerless to intervene. I do not own life, you often said when you tried to laugh your difficulties away. Many people could not see that you were not merely throwing jokes around. You did not own your life when you were alive. Now that you are alive in a different realm, you know for sure that you do not own life. You have watched God and Devil, gods and Ancestors, wondering whether *they* owned it, this thing called life. As far as you could see no one seemed to own it, judging by the way they too cast their eyes in the directions of our Hillbrow, Alexandra, and Tiragalong, clicking their tongues in deep sadness or grim amusement as people devoured one another. You were right there with them, still on your way to finding out whether any of them owned life. You, Refentše, child of Tiragalong (and, as you insisted in the days just before your death, also of Hillbrow), had never shared such sentiments. It was your opinion that the moral decay of Hillbrow, so often talked about, was in fact no worse than that of Tiragalong. Cousin insisted that people should remain in their own countries and try to sort out the problems of those respective countries, rather than fleeing them; South Africa had too many problems of its own. During his years in Hillbrow, Refentše completes his studies and becomes a lecturer at the university. He dreams of writing a novel about his neighbourhood, believing it to be the kind of place underrepresented in literature. He only manages to publish one short story, one that explores, through the fate of its female protagonist, the limitations of writing in traditional tongues in a country with eleven official languages, but where only two dominate to the practical exclusion of the others. Mpe quite effectively works his arguments into and against the prevailing dynamics in South African literature: his main character reads Coetzee (Waiting for the Barbarians), while later, in Oxford, Refilwe introduces an Irish barman to Zakes Mda (Ways of Dying). He can be seen as attempting to build a bridge between established authors—with novels that reflect themes in his own work—and a vision of a literature that could be more inclusive of other languages, such as his native Sepedi. Toward the end of the novel, the narrative zeroes in on Refilwe as she finally has the opportunity to pursue her MA at Oxford, but the narrator(s) will not actually address her directly until the closing passages of the book. Several years have passed since Refentše’s death, and guilt over her treatment of Lerato, plus her experiences living and working in Johannesburg, have softened her own xenophobic tendencies. While she is overseas she meets and falls in love with a Nigerian man. However, their bliss is cut short when they learn they both have AIDS, and would have in fact been HIV positive for many years. Her fate will serve to challenge the prejudices of Tiragalong when she returns home. Subtle shifts in the narrative voice through the final chapter, serve to add power to its heartbreaking conclusion. The critical examination of contemporary themes, within a narrative shaped by the rhythms and poetry of an African oral tradition, offers readers an experience that is both fresh and deeply moving. Echoes of Mpe’s work, together with that of K. Sello Duiker, another young and tragically short-lived black writer who emerged in the early post-Apartheid years, has continued to resonate through an entire generation of young South African writers who are producing vital and original literature today. 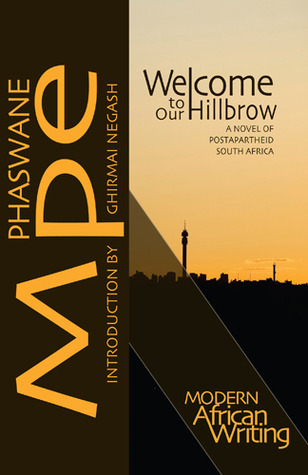 Welcome to Our Hillbrow: A Novel of Postapartheid South Africa, by Phaswane Mpe is available from Ohio University Press, with an excellent introduction by Ghirmai Negash. I found it difficult to capture the remarkable complexity of the novel. Some Goodreads reviewers found it cold because they felt it did not emotionally engage with the characters, but I suspect that is due to expectations of typical (western) English language literature. And I have to admit that the final chapter was extremely moving. At the same time, the fact that the key characters are well educated, become publishers and lecturers, offers an unconventional presentation of young people caught between traditional and modern realities. That sounds very good indeed. I’ll see if it’s available in the UK. I like your thought on communal first person voice. Is this mostly ’80s/’90s or more contemporary? The book originally came out in 2001 (the author died in 2004 at age 34), so it is set in the 1990s. That said, the dynamics and tensions explored in this novel still exist in this and similar neighbourhoods. The xenophobic attitudes are, of course, widespread these days far beyond South Africa.